Available in stylish colors, they can be layered up with Stonz' Rain Boot Linerz to keep those toes extra cozy in cooler days. Kids LOVE the style, super easy to put on, comfortable and quick-dry lining. Why these over less expensive rain boots? Easy, you get what you pay for. These boots are stylish, rugged yet soft for comfort, made of non-toxic natural rubber, and will last a long time! Pass them on to the second/third child or give them to friends. The best part is you can add the liner (sold separately) to automatically add warmth for those wet and chilly days. Designed in Canada where they know how to keep warm! VERSATILE: wear them in fall, winter and spring - just layer up or down with the liner (sold separately). Go ahead and send your child to school with the liner because if the day turns out beautiful by the afternoon recess, they can forego the liner - totally their call! SAFE: Made of non-toxic natural rubber; no harmful additives such as lead, phthalates, pvc, cadmium, etc. The paint is lead-free and the glue is formaldehyde-free. HIGH QUALITY: Made to last! Durable and tear resistant, yet flexible and comfortable. COMFY: Boot lining is 100% soft cotton that wicks away moisture quickly. Whether it's sweaty feet or puddle splashing, the boots will dry quickly! SAFETY FIRST - Be careful with typical rubber boots. They're full of harmful chemicals that should be far away from kids. 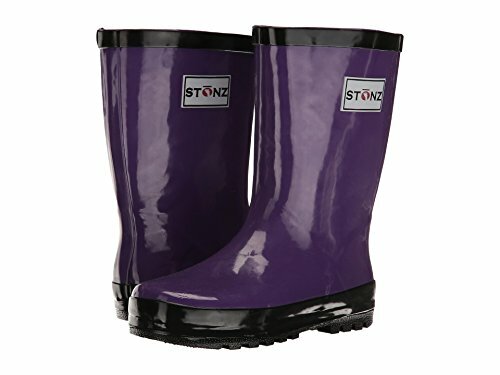 Stonz rain bootz are made of 100% natural rubber with no harmful additives such as lead, pvc, phthalates, cadmium, etc. The paint is lead-free and the glue is formaldehyde-free. FLEXIBLE & COMFORTABLE - Can they be non-toxic, flexible and comfortable? Absolutely! Made of thick and soft rubber that makes them flexible and comfortable, yet rugged to last a long time. Flexibility is important to allow kids to bend down and run without any restrictions. QUICK-DRY 100% COTTON LINER - Rainboots are made to get wet so we've designed a 100% cotton liner that quickly wicks away moisture so the boots dry quickly and the feet stay warm and dry. STYLISH - We knew that 100% natural rubber, flexible and rugged boots would not be complete without making them stylish and fashionable. Fantastic colors that your kids will love and want to wear over and over again. HAPPY CUSTOMERS - We stand behind our product so buy with confidence and know that we'll gladly replace any item with a problem. If you have any questions about this product by Stonz, contact us by completing and submitting the form below. If you are looking for a specif part number, please include it with your message.